We've been parents to a newborn for four weeks now. That's four weeks with even less sleep than I got whilst pregnant...I'm exhausted! With Bubba we started a sleep routine very early and she became a great sleeper...until she hit toddler status and decided sleep was for wimps and she didn't have to do it if she didn't want to. Fast forward to now and in a fit of I don't know what, on Monday I decided it was the day to start. 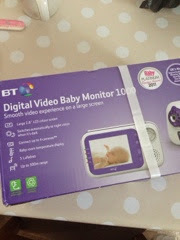 So I bathed the boy and hubby set up our new monitor in the bedroom. 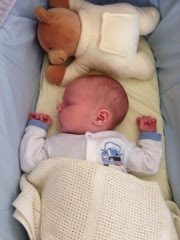 7pm and the little man was settled in his Moses basket upstairs, I was a jibbering wreck downstairs! 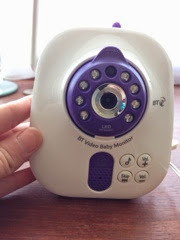 We are road testing the BT Digital Baby Monitor 1000. First time around we didn't use a video monitor with Bubba but I couldn't have put the boy upstairs without it. As monitors go, it's easy to set up and the manual is easy to use. At one point I thought we had a broken unit because I couldn't hear any sound and it kept coming on and going off. I decided to read the manual and realised it only comes on when he makes a noise. As it's early days I like to hear the noise all around the room, I find it comforting. So I turned up the sensitivity levels and I can hear the white noise in the room. The 'parent' unit is slim and has a great picture. Hubby was impressed with the quality of the picture and you can zoom in or out but can't move the monitor (unless it's manually). 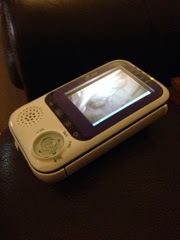 It plays some melodies and you can also talk through the unit to the child's unit...we tested this out when I thought it wasn't working and hubby went up and waved at the screen and I hissed down the microphone that I could see and hear him and he'd better not wake up baby. It has a colour screen that then changes to infra red at night time. The parent unit is nice and compact and I've mainly been sitting with it next to me and I try not to look at it that often. It's given me peace of mind and helped make the transition from having baby near me to moving him (admittedly not that far but still...it's only four weeks!). 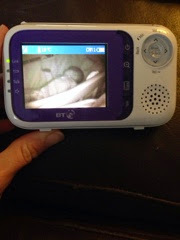 I can't find fault with this monitor and we are so glad we are using it - although as I type the boy doesn't seem to want to go to sleep tonight!